With some predicting China will import 79% of its oil by 2030, could domestic shale gas extraction help China meet its energy needs? As shale gas fever sweeps through Beijing, analysts are looking at the costs and benefits of extracting what is increasingly a controversial source of energy. But for China, with its growing middle class, the immediate and long-term demand for energy has the potential to spark a revolution in shale gas before sufficient and safe technological know-how and regulations are developed. A very vocal debate continues to rage in the U.S. and Europe as to the environmental consequences of shale gas extraction. Meanwhile, China’s National Oil Companies (NOCs) continue to purchase and buy into North American oil and gas companies with specific expertise in shale gas extraction. For better or worse, China’s shale gas revolution looks set to be thrust into the public spotlight, both at home and abroad. Extracting shale gas is tricky. Shale, a sedimentary rock that is typically highly porous and has low permeability, traps hydrocarbons as it is formed. 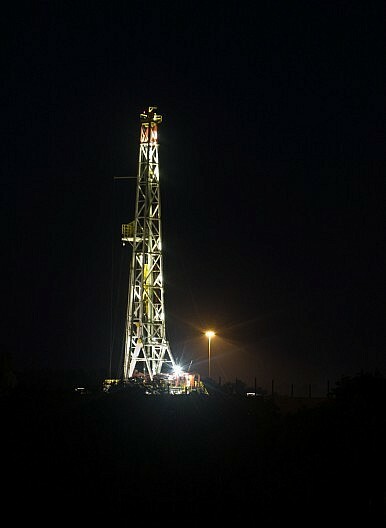 To remove the gas, shale formations must be stimulated, most commonly using hydraulic fracturing, or “fracking.” The technique involves pumping water, sand and chemicals at high pressure into the shale formation, cracking the rock and allowing the gas to be released to the surface. The 1 to 3 million gallons of water that are pumped into the shale formation must then either be recycled or pumped into water disposal wells in subsurface rock formations. In addition to these skill-intensive practices, the extraction process also demands three-dimensional seismic surveying, which evaluates potential subsurface resources, and horizontal drilling technology. Both demand expertise and experience, yet the capability of most companies outside of North America, including China’s National Oil Companies (NOCs), to safely and effectively perform such high-tech extraction is limited. The emergence of shale gas is a game changer. Countries that have traditionally relied on hydrocarbon exports for political clout (the Persian Gulf, Russia, Venezuela) will inevitably lose some of their petro power. Europe could become less energy dependent on Russian supply by importing liquid natural gas (LNG) from North America and by exploiting the potentially significant shale gas deposits in Poland and other countries. Australia, which has significant deposits and much of the pre-existing infrastructure to begin extraction, could see its clout in the energy politics of the region increase– forcing a significant redraft of Canberra’s “Australia in the Asian Century” White Paper. In effect, the “shale revolution” signals the end of the peak oil debate. New technology means new resources, which in turn could mean a new geopolitical map. However the mere presence of the resources doesn’t mean that their extraction in the short-term is viable, a problem China knows all too well. Estimates of China’s shale gas resources differ. China’s Ministry of Land and Resources estimates reserves of 886 trillion cubic feet (tcf), while the U.S. Energy Information Administration puts the country’s resources at 1,275 tcf. The upper estimates would mean China sits atop more shale gas than the U.S. and Canada combined. According to China’s 12th Five-Year Plan, by 2015 China should be extracting 6.5 billion cubic meters of shale gas per year, with a view of producing 100 billion cubic meters by 2020. China’s goal is to meet 10 percent of the country’s energy demands from shale gas the same year. To successfully meet the goal, China’s oil and gas industry needs to bridge its large knowledge deficit. Despite some progress, recent successes in domestic extraction technology have been modest.